Health and Development at Great Lakes University, Kisumu. Sally has a Bachelor’s degree in Nursing and holds a Diploma in Community Health Nursing attained at KMTC –Nairobi. She did her Kenya Certificate of Secondary Education at Itigo Girls Secondary School. With over 20 years in service, Sally has worked at all levels of health care, starting from the dispensary to level 4, as a Nurse practitioner, Mentor, Researcher and as a Nurse Manager. 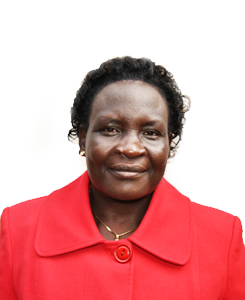 Sally has worked as the Nursing Service Manager and Nurse Manager at Kapsabet County Referral Hospital. Previously, Sally worked as at Kapsabet District as a Hospital-Unit manager, Kampi ya Samaki dispensary as a nurse manager and at Baringo District Hospital as a nurse manager in charge of the maternity unit. At Kenyatta National Hospital, Sally worked as a KMTC Nairobi-Student Nurse. Other responsibilities include being a BOM member at St. Paul’s Chemalal and Kimwani Secondary Schools in Chemelil Chemase Ward representing community. Sally is married and blessed with children.